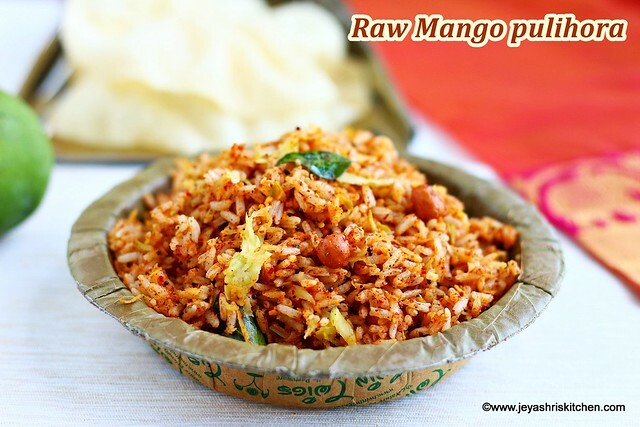 Raw mango pulihora| Mango pulihora| mamadikaya pulihora an easy no onion no garlic chitranna recipe, using raw mango and other freshly ground spices. This South Indian rice variety is a perfect lunch box recipe too. 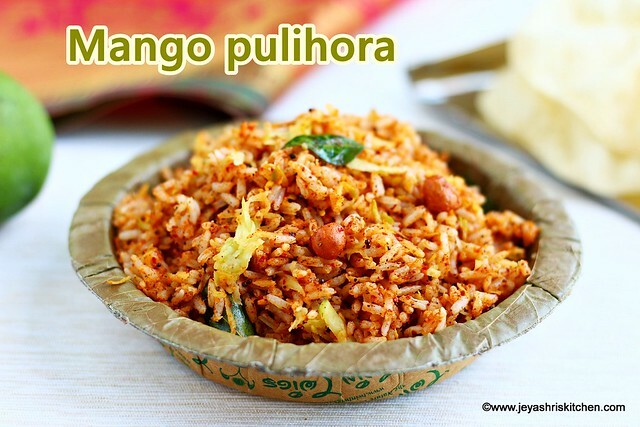 Generally the raw mango rice is called as Mango pulihora. I saw the name in an instagram page some time back and wanted to try this using the spices we use for the Iyengar puliyodarai. 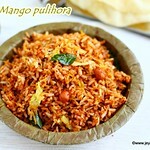 As tomorrow is Ugadi festival i thought i will try this Mango pulihora today and share the recipe of the same here. Raw mangoes are in season now and generally we make cut mango pickle or avakkai orugai using raw mango. For the Tamil new year and Telugu new year( ugadai pandigai) we make Chitranna| variety rice in the menu along with Mango pachadi and neem flower rasam. Also holige| Obbatu | poli is made in some houses for ugadi | tamil new year. Check out my complete collection of Ugadi |tamil new year festival recipes. Description: Raw mango pulihora| Mango pulihora an easy no onion no garlic chitranna recipe, using raw mango and other freshly ground spices. Wash the rice and add 1 cup of water and pressure cook for 4-5 whistles. Once the pressure is released, open the cooker and spread the rice in a wide plate. Let's proceed to make the spice mix for puliyodarai. Dry roast the dhaniya, whole black pepper, urad dal, chana dal, red chili and venthayam. Roast till the dal gets golden brown colour. Roast in a low flame and ensure not to burn it. Once done switch off the flame and add the dry coconut if adding. Make this into a fine powder. Pulihora powder is ready. This yielded 4 tblsp of powder. In a pan add sesame oil, and add in the mustard seeds, asafoetida, curry leaves and peanuts. Roast till the peanuts turn golden colour. Switch off the flame and add the cooked rice. Add salt and the grated mango to this. I added 1/2 cup of grated raw mango, you can add 1 or 2 tblsp more if the mango is not too sour. Add 3 tblsp of the pulihora powder to this. Mix well gently and evenly. Raw mango pulihora is ready. This tastes well with appalam or vadam. Ensure that the rice is cooked in separate grains. Rice can be replaced with millets too. Adjust the quantity of red chilies in the mango pulihora according to the sourness of the mangoes. Hi there is no need of sauting mango know? Wow!Nice innovation.Looks yummy.Will give it a try.